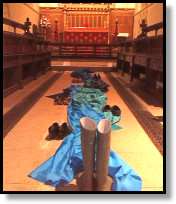 In the Northern Saints chapel at All Saints there are some helps to pray, reflect on and think through the issues around the current refugee crisis and mass movement of migrants. 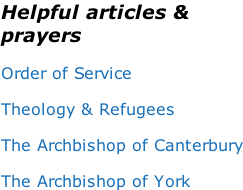 The Gospel calls us to welcome the stranger, whoever that is, and to minister to those in need without prejudice or judgement. Our faith story is one of exile, as shown in the stories of the Old Testament, Jesus himself was a refugee as a child, and as an adult had nowhere permanent to call home. He showed us by example how to treat others whom we think of as different from ourselves, to them as God sees them. For we are all strangers in need of welcome. 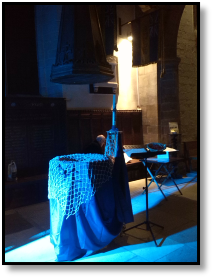 We enjoy a rich mixture of services at 6pm - with a sung Evensong on the first and third Sundays usually, but different kinds and styles of worship on the other Sundays. 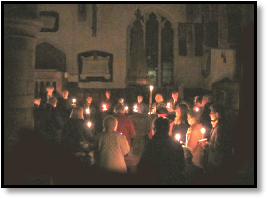 A service which includes prayer for healing and wholeness is held once a month and worship using all kinds of non-traditional words and music takes place on the other Sunday. This year’s Christmas Tree Festival exceeded all our expectations. 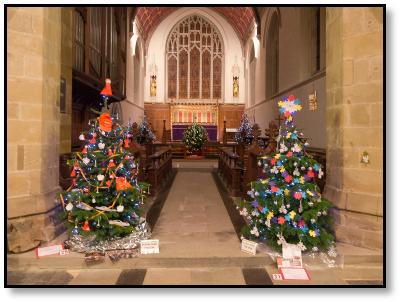 From Friday to Sunday of the first weekend in December All Saints was filled with a stunning display of Christmas Trees sponsored by local businesses and individuals and decorated by schools and community groups. Over 3,000 visitors came to enjoy the spectacle - some coming more than once, bringing their friends and family who had not yet seen it to wonder at the sight!